click here to see it in Windows Media format. We have a vibrant, well-represented international student body, with a designated International Student Advisor and an active International Student Association (ISA). The ISA promotes the diversity of the International student population through cultural meetings and events, including the annual International Festival held on campus each spring. Approximately one-third —39%— of our graduate students are international students, and they come from 18 different countries (Austria, Bangladesh, Brazil, Bulgaria, Georgia, Greece, India, Iran, Japan, Mongolia, Myanmar, Nigeria, People's Republic of China, Philippines, Romania, Russia, Sierra Leone, Singapore). If you have any questions, please feel free to contact the International Student Advisor. 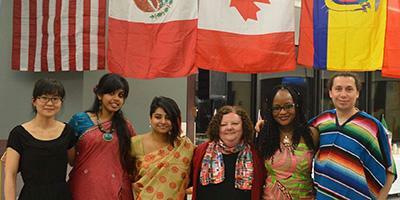 The International Student Association sponsors an annual International Festival. Pictured are students in the College of Graduate Studies with our International Student Advisor: Pei-Ju Liu, Sumana Sundaramurthy, Peu Santra, Jennifer Abbott (International Student Advisor), Esther Mutongi and Arturo Barbachano-Guerrero.